No matter how you slice it Golden State Warriors’ guard and two-time NBA MVP, Steph Curry, will not make the cut this week at the Web.com Tour’s Ellie Mae Classic. Don’t get me wrong he’s a really good player, as Gary Koch would remind us over and over again, “Better than Most!” but, pardon the pun, this week he is way out of his league. I salute the tournament director for extending the invitation and I applaud Curry for accepting. This tournament used to be included in the Golf Channel’s broadcast schedule; it’s not any longer. Any attempt to generate interest in the event, any reason to get folks out to Hayward and the TPC Stonebrae, is welcome. Asking a really good player, and by all accounts an even better guy to play in your event can’t ever be a bad thing. Include the fact that the same guy just might be the most popular athlete within in a thousand miles of the event and you have the ultimate no-brainer. But all those fans, all those young golfers, better get out there today, tomorrow or Friday because Steph won’t be around for the weekend. I was at this event in 2010 when NFL Hall of Fame receiver Jerry Rice did what future NBA Hall of Fame guard Stephen Curry is doing this week, playing in a PGA TOUR sanctioned event for the first time. Rice shot 83-76 and beat one guy, Brendon Todd. I should note that his first round 83 was 2 shots better than PGA TOUR veteran Brian Bateman who subsequently, because of injury or shame, withdrew. My point is Jerry Rice was a good player, not as good as he thought he was or anywhere near as good as Curry but good. He just wasn’t anywhere near good enough to compete (and by that I mean make the cut) on this stage. Neither is Steph. Another obstacle facing Curry is the venue, the TPC Stonebrae. Designed by David McLay Kidd, it’s better suited for a billy-goat than the guy who may ended up being the GOAT of NBA guards. It plays almost 7,200 yards from the “Tour” tees and offers its fair share of uphill, downhill and side hill lies (often times on the same hole). It’s got five par 5’s and Steph is going to have to birdie at least three of them each day if he has any chance of shooting a good score. Curry has plied his trade on basketball courts all over the world but no matter where he is, the court is the same size and the hoop is 10 feet off the floor. Golf is different, professional golf is different from that. Playing with your pals, at your home course, during an off day in a playoff series is one thing. So is playing a practice round the day before a tournament. But when the figurative gun goes off and every putt matters, every stroke counts, on a golf course with teeing grounds and hole locations set up to test the game’s best? That brings it to a whole new level. I headed up the production team that broadcast this event in 2010 (the first year Rice played), the winner was Kevin Chappell who went on to win on the PGA TOUR for the first time this year. Other TOUR winners, Tony Finau (2016 Puerto Rico Open) and Si Woo Kim (2016 Wyndham Championship, 2017 The PLAYERS) have won this tournament . Last year’s champion, Stephen Jaeger, has not won on the PGA TOUR, may never. He’ll get that chance again next year but for now he is back in Northern California defending his title and that’s another problem for Stephen Curry. In a rare, if not unprecedented, move the Web.com Tour has inserted Sponsor Exemption Steph Curry into the group that includes Jaeger and another winner this year, Sam Ryder. Normally players are assigned tee times for the first two rounds of an event by categories. The “A” category includes, among other criteria, Tour winners. The “B” category is composed of a level of competitors just below the “A” guys. And then there is the “C” group which normally includes Monday qualifiers and sponsor’s exemptions like Steph. The “A” guys get the best tee times, “B” next, and the “C” group goes either first of last off each day. I can only surmise that the Tournament Director, with or without the urging of the title sponsor, went to the PGA TOUR official responsible for running the event and asked for the favorable grouping for Curry (even though I contend it’s not all that favorable for Steph). The TOUR acquiesced after (I am hopeful this is the case) asking both Jaeger and Ryder if it was okay with them. So now, instead of going off in relative anonymity as part of one of the first three groups on either Thursday or Friday (he’d be in one of the last three groupings the other day), Stephen Curry has to play in the heart of the draw BOTH days with two of the Web.com Tour’s best players. As if he needed that added pressure. I’ve read Curry plays to a +.7 handicap. That’s amazing. That’s really, really good. But it’s chump change compared to Jaeger, Ryder (currently ranked 3rd and 2nd on that Tour’s $ list) or even Justin Shin who’s ranked 202nd after making just $3,254 in 15 events this year. My point is not to belittle Curry’s golf accomplishments but to highlight the great play of the best players in the world, including Justin Shin. Stephan Curry, I bet, was nervous at some point during every single one of the games he played during all of his NBA Finals appearances but those nerves will pale in comparison to the one’s he’ll feel on the tenth tee at around 9 AM PT on Thursday (his tee time is 8:55 AM but he’s slated to tee of third in the group). Stephen Curry won’t break 80 on Thursday, My bet is he does on Friday but he’ll miss the cut by a mile; probably finish last among the players that complete 36 holes. But that won’t change the fact that, as an NBA superstar, he’s a really good golfer. And it won’t, at least in my eyes, diminish the positive impact he has made on both this tournament and that tour. He should hold his head high as he deposits his clubs into, and gently closes the trunk of, his car late Friday afternoon. I just hope he’s signed every autograph request and showered his fans with smiles on the way to the parking lot. Thanks for reading my blog. If you liked this, and are interested, please check out my two books. 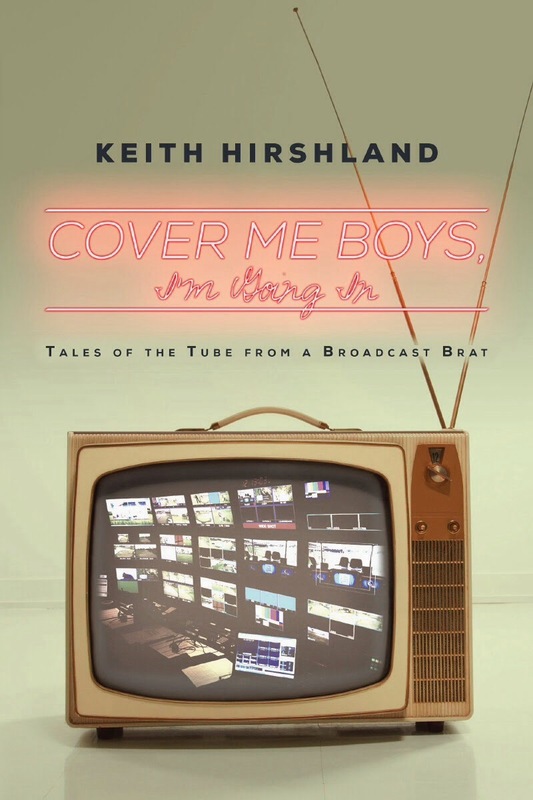 Cover Me Boys, I’m Going In (Tales of the Tube from a Broadcast Brat) is a memoir about my career in broadcasting that includes stories from my time at both ESPN and The Golf Channel. Big Flies, is a mystery that incorporates four real-life, still unsolved, robberies to tell the story of a father and a son. Both are available at Amazon. My name is Keith Hirshland and I am a four decades television veteran who has spent time both in front of and behind the camera. During nearly forty years in broadcasting my path has crossed in front of, behind and alongside some of the best in the business... And some of the worst. Many of those people I count as friends while others wouldn't make the effort to spit on me if I was on fire. This television life started early watching my Mom and Dad found, fund and run a local affiliate TV station in Reno, Nevada. As a teenager approaching adulthood I worked for them, first as an on-air sports reporter/anchor and later as a director and producer. Jobs in the industry took me across the country and then to many places around the world. Sports is my passion and putting it on TV has been my business. Production credits include auto racing, baseball, basketball, bowling, college football, field hockey, soccer, volleyball and water polo but the majority of my time "in the chair" since 1990 has been invested in the game of golf with both ESPN and The Golf. Channel ( I was one of the first forty people hired by TGC in 1994 ). I am a fan and I watch TV sports as a fan but I also have hundreds of thousands of hours watching from inside a production truck. I think that makes me qualified to comment, my hope is you agree. I have written three books, Cover Me Boys, I'm Going In (Tales of the Tube from a Broadcast Brat), a memoir that is a tribute to my parents, the hard working, creative people who started ESPN2 and The Golf Channel and a look back at my life in television. Cover Me Boys was awarded the “Memoir of the Year” in 2017 by Book Talk Radio Club. My second book is a novel, Big Flies, and is a mystery that tells the story of a father and a son with four of the world's most notorious unsolved robberies as a backdrop. Big Flies was named “Solo Medalist” in the True Crime category by New Apple Awards. My third book, another mystery titled The Flower Girl Murder was just published. All three are available at Amazon. I look forward to sharing new thoughts about golf, golf television, sports in general and the broadcast industry with you. The views expressed here are mine and mine alone. They are not connected to nor endorsed by any other person, association, company or organization. This entry was posted in general observations, Golf, sports and tagged Ellie Mae Classic, Jerry Rice, Kevin Chappell, Sam Ryder, Si Woo Kim, Steph Curry, Stephen jaeger, Tony Finau, Web.com Tour. Bookmark the permalink. Great insight Keith. Read both your books. As someone who has been a part of thsis with my 27 years at IMG, I agree with your assessment. At least the crowds will enjoy it. I hope Stephen has the patience with his group. Why Aren’t We More Inspired?